We humans tend to shy away from suffering of any kind, even when we know that we learn from our mistakes and not from our successes. As we consider our many failures, rather than focus on our imperfections, let us rather consider how persistent we might be in following the one true Shepherd of souls. 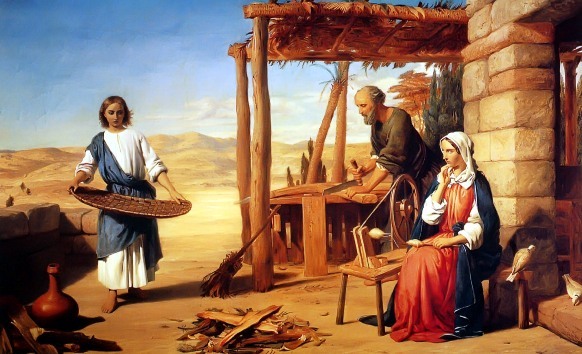 Critics comment that Herbert foreshadows the cross with the workshop bits on the ground and we see how the young Jesus stares intently at these pieces of wood which have carelessly fallen into the shape of a cross. The family in Millais’s painting was seen as too “ordinary” when it was first shown. What might the criticism be today? To learn more about these paintings, click on the images. To suggest other images we might enjoy seeing, enter the painter and the name of the work as a the comment to this post. Over the next few weeks we will be away from easy internet access but we will be pausing to read scripture and to pray and reflect at noon, keeping those in The Noontime Circle in mid-day prayer. You may want to click on the Connecting at Noon page on this blog at: https://thenoontimes.com/connecting-at-noon/ Or you may want to follow a series of brief posts that begins today, inspired by paintings of the life of Jesus Christ that can be found at: http://www.jesus-story.net/painting_family.htm In these posts, we will have the opportunity to reflect on a scripture verse and an artist’s rendition of that event. Wishing you grace and love and peace in Christ Jesus.